Zoho Mail Suite provides enterprise email hosting features to satisfy the needs of organizations of all types and sizes. Zoho Mail provides custom domain-based email address for all members of your organization in no time.The entire set up process is simple. The steps to migrate your email hosting to Zoho and some of the features available are outlined. Once you complete the entire email hosting setup with Zoho, you as the Super admin can access the Control panel, which is used to administrate the email settings of the organization. There are numerous options to set policies for compliance purposes, to backup accounts, to manage address books, resource booking and so on in the Control Panel. All the options are menu driven and hence the administrators do not need to create and execute complex command sets or code files for managing the users and the email service. You'll need to add and verify the domain you want to set up the email hosting for. The verification process is required to ensure that you have Administrator privileges for the domain and are entitled to set up and use the domain with our services. If you have registered your domain through Zoho, then you can skip this step. 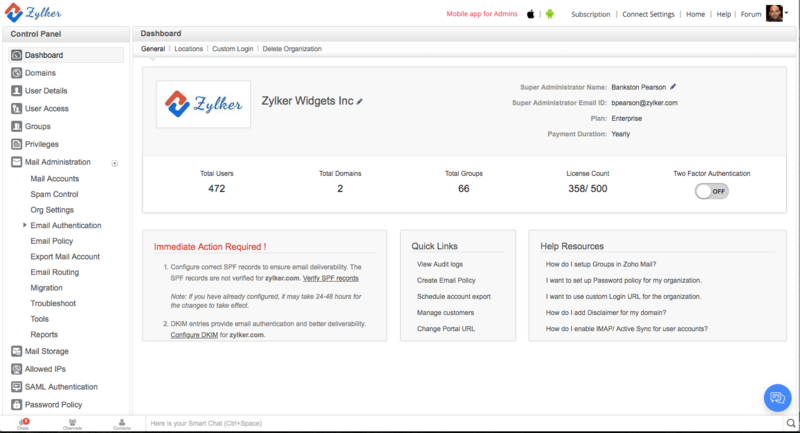 After your domain is verified, add or import users and create their mail accounts. Set up Groups for common accounts that are used by more than one user. You can create multiple email addresses for a single user, by creating multiple email aliases for the same user account. Refer here for instructions. Once you have added the mail accounts, you'll need to change the MX Records of the domain. After the MX Records are set up, emails will be delivered to your Zoho Mail account. Click here to learn about the advanced Email Routing options available in Zoho Mail. Migrate email accounts from your previous servers via POP or IMAP protocols. You can also opt for a PST Migration or Exchange migration if you have your emails in your Exchange Server or as PST files. Sender Policy Framework Records are recommended to validate the emails sent from your domain. SPF Records are also used to prevent email spoofing (messages sent by spammers with forged From addresses at your domain) by specifying which IP addresses and mail servers are allowed to send email on behalf of your domain. DKIM is a common email authentication system, that includes a unique signature in the header, generated by a private key configured for the specific domain in the server. The public key published in your DNS is used to validate the DKIM signature by the receiving server. Based on the validation results, the mail will be classified as genuine or spam. Catch all Setup: A catch-all account is set up to ensure that emails that are addressed to your domain but to an account that's either not set up or misspelled do not get lost. Such emails will be delivered to the catch-all account. For example, if you've set up accounts for manager@thatcompany.com and info@thatcompany.com, but a sender addresses an email to help@thatcompany.com, which you've missed to set up, the email will be delivered to the catch-all account instead of being bounced back. Dual delivery: Set up dual delivery for your domain by configuring a second mail server for your domain. Login page customization: You can create a personalized login URL when you add a CNAME alias (pointing to business.zoho.com) to your DNS records. You can customize the page even more by uploading your company's logo using Zoho Mail Suite's Control Panel. Once you have set up the webmail, refer the POP and IMAP pages for further configuration in POP and IMAP clients like Outlook, iPhone etc. Zoho Mail also provides domain registration and auto-renewal services. Domains registered through Zoho are designed for seamless use with Zoho Mail. Domain verification is automatic and MX entries are pre-configured.